Betsy DeVos’s hearing for Secretary of Education is underway, and considering she is a billionaire GOP donor with little demonstrable regard for or experience with the public schools she’ll be tasked with running, her reception amongst Democrats in the committee has been pretty chilly. Later, Sen. Bernie Sanders, face-to-face with perhaps one of the most extreme encapsulations of the oligarchic system he’s hoarsely denounced, asked DeVos point-blank how much her family has donated to the Republican party over the years. 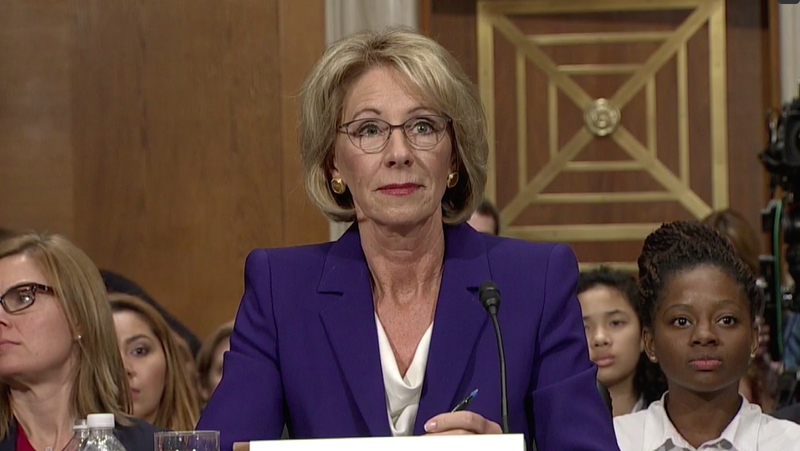 “I wish I could give you that number, I don’t know—” DeVos hedged apologetically. “I have heard in the ballpark of $200 million, does that sound correct?” Sanders interrupted. DeVos shrugged, and allowed that this was a possibility. Sanders also asked whether DeVos thought she’d be nominated for this position “if you were not a multi-billionaire, if your family had not given hundreds of millions of dollars in contributions.” She thought so, yes. Incredibly, DeVos also hedged on the question of sexual assault on college campuses. Sen. Bob Casey pointed out that 1 in 5 women are the victims of sexual assault on campus, and asked if DeVos would commit to retaining the current “preponderance of the evidence” standard in such cases. No, she would not! DeVos affirmed that she thinks assault is bad, though. “If confirmed, I look forward to understanding the past actions and the current situation better, and to ensuring that the intent of the law is actually carried out in a way that recognizes both the rights of the victims as well as those that are accused,” she said. “The organization that has that position, which is contrary to the current law and contrary to the spirit of what that legislation was trying to do, was the recipient of a donation of about 25,000 bucks over four years,” Casey countered. “I hope that’s not a conflict of interest,” he added.